A mere day after uncovering the latest technology for helping golf cheats, we stumble upon a wireless method for landing a whopper next time you’ve gone fishing. 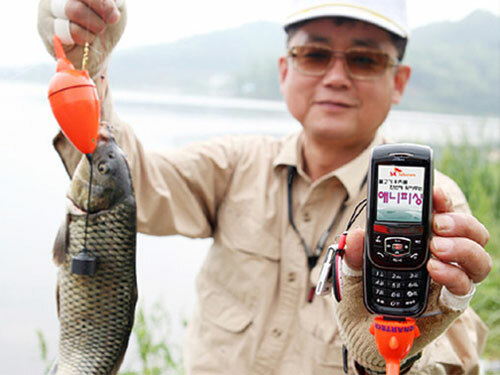 The unnamed 100,000 won device is an adjunct to mobile phones from Korea’s SK Telecom that can be clipped to a fishing rod and used to divine what the scaly objects of our piscatorial pastime are up to in the water near the line and hook. Data, gathered by ultrasonics, on fish density and water temperature flow up the line to the device, which then transmits the information to a receiver attached to an SK phone. Naturally, casting into a fish-rich area of water and laughing all the way home is the name of the game. SK may be sitting pretty now, as it reels in the angling phone fans, but rumour has it rivals are planning to market sticks of dynamite in the next round of one-upmanship. Incidentally, SK – in common with many Korean firms – doesn’t allow deep-linking to its website, so you’ll have to find the product page (in Korean) by yourself. Otherwise, feel free to check out the fisherman’s friend device over at Infoworld.